Like any Rock Star, Antelope Canyon, located just a few miles east of Page, Arizona, has amassed a huge and loyal fan base. If you doubt that, just go to Facebook or YouTube and note all the videos and photographs you find there. 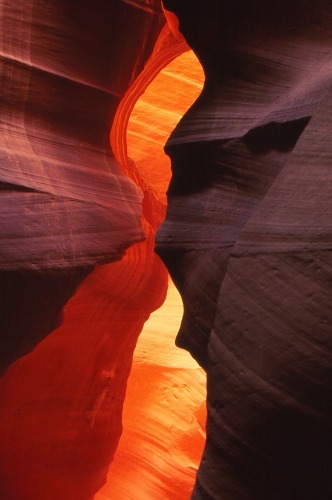 Antelope Canyon is really two separate canyons, an upper canyon, sometimes called Corkscrew Canyon, and a lower canyon. They are, in fact, separated by several miles of flat desert terrain. The upper canyon is located south of Hwy 98 near mile marker 299, and the lower canyon is accessed off Navajo Route 22B, which is the road to Antelope Point Marina. Corkscrew Canyon is proof that a slot canyon need not be long and inaccessible to be beautiful. In fact, it is only about 600 feet long and within a short walking distance of a major thoroughfare. As you approach the narrow slit that is the entrance, there is nothing about it to suggest that just a few feet inside is a dreamscape of twisted, swirling, convoluted, tortuous, multi-hued sandstone rock. And, therein lays the beauty. Antelope Canyon is part of the Navajo Nation and a permit is required to visit both the upper and the lower slots. The Navajo permit costs $6.00 per person. However, there is an additional $20.00 fee which goes to the families who control access to the slots. At the upper canyon, the permits are obtained at a shaded booth in the parking area just off Hwy 98. From this parking area, you will be driven the two miles to the slot by a Navajo guide where you will then be free to explore the slot on your own. Your visit will be limited to two hours, and at the end of two hours you will be given a ride back to your car. Visits longer than two hours will cost you an additional $5.00 per hour. At the lower canyon, the fees are the same and are collected by attendants in the parking area near the slot entrance. Access to the upper canyon is easy and straight forward. The slot is flat and above ground. However, the lower canyon is more physically challenging and is accessed by climbing down a ladder bolted to the canyon wall. The slot is longer and deeper than the upper canyon, and as you make your way ever deeper into the canyon, there are other ladders to descend. As a result of the flash flood that swept through lower Antelope Canyon in August 1997, drowning 11 people, a guide must now accompany you on your visit. If you want to get truly good pictures, you need to use a tripod. Only then can you hold your camera steady enough during the long exposures required in the low ambient light. 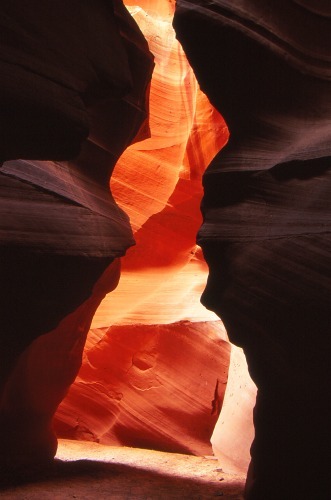 The summer months, when the sun is higher in the northern sky, is a great time to photograph Antelope Canyon. It is that time of the year when the light more easily penetrates the slot’s ceiling. Another good time to photograph the slots is during the middle of the day, specifically around the noon hour. This is the time to get images of the ray of light spotlighting the sandy floor and anyone standing in its beam. Both the upper and lower canyons are just off Hwy 98, 4 miles east of Page, Arizona. Books and Maps may be purchased through Amazon.com by clicking the link below. To find lodging in Page, Arizona, simply use the box on the right which is powered by Hotels Combined. Enter the dates you desire and, magically, they will show you all the lodging that is available on the dates you need them.